Marble and marble veneers are natural products formed thousands of years ago. Each marble piece will vary in color, texture and pattern. You may even feel inconsistencies on the surface. These indentations are not flaws, but nature's guarantee of authenticity. To clean, wipe the stone with a solution of warm water and a small amount of mild soap. Water or spills should not affect the polished marble unless it is left uncleaned. Do not put a porous pot or planter on the finish for any length of time. It can release moisture, causing the finish to leave a mark or ring. Use a quality polish to help keep the luster of the natural stone. Over time, quality cushioning conforms to your particular shape and usage pattern adding a personal look to your upholstered home furnishings. Your cushions may at first feel firmer than those in our showroom. They will become more comfortable with each use. Today's relaxed and casual looks use fabrics that sometimes appear wrinkled or lived-in. Please don't confuse normal softening and flattening that may occur with actual loss of foam resilience. Some manufacturers will ship upholstered furniture with the skirt up. It will fall to its proper place in a short period of time. "Fluff" pillows and loose cushions with each use. Seat cushions should be flipped occasionally. (Don't forget to vacuum underneath.) To extend the life of a piece, rotate cushions whenever possible. Some "pillow top" seating may develop comfort wrinkles which are natural and actually add to the overall casual comfort of the piece. Vacuum all upholstery once a week with a brush attachment. Pilling is normal for all fabrics when they shed their excess fiber. Using a fabric shaver will remove unwanted pills. Direct sunlight, heat and moisture should be kept away from upholstery as fading and discoloration may occur. Never sit on a recliner's footrest, the end of an open sleeper, or the arms of furniture. Keep pets off furniture. Pet urine and pet body oil can be difficult to remove. Arm rests are not designed to be used to assist in getting off of your furniture. When moving your furniture, always lift it. Please do not drag or push your furniture. This could damage your furniture or your floor. Professionally clean your furniture once a year. As a general rule, when a spill occurs, it is important to clean the fabric immediately. The longer a spot remains, the harder it is to remove; it may even become permanent. Before you try to remove a stain or soil from your upholstery, you should determine the type of fabric involved. Some manufacturers make this easy for you by placing cleaning codes on furniture. (You'll find the code either on the furniture hang tag or on the manufacturer's label.) These codes indicate the type of fabric involved - cotton, wool, polyester, etc. and suggest the best methods of cleaning and spot removal. WS: Clean with water-based cleaning agents and foams, as well as with mild, water-free dry cleaning solvents. 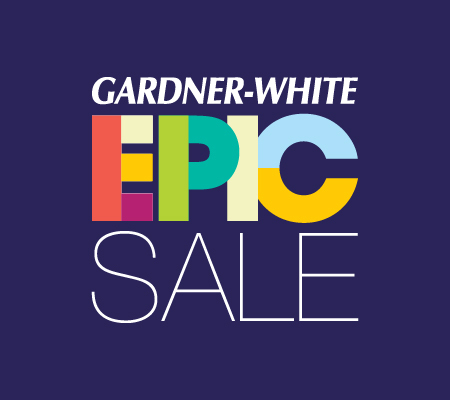 If you purchased the Gardner-White protection plan, use the cleaning agent provided in the box at the time of delivery. W: Use water-based cleaning agents or foams only. S: Use only mild, water-free dry cleaning solvents. X: Vacuum or brush lightly to remove soil. To do everything possible to protect your investment in your new furniture we recommend the Furniture Care Protection plan. Routinely dust or vacuum with a soft brush attachment. Blot liquid spills with a clean dry cloth immediately. Food spills should be removed with a damp cloth or sponge immediately. Keep at a minimum of 12" away from direct heat sources. Keep out of any direct sunlight. Avoid using or placing sharp objects on leather goods. Leather is very durable, but not accident or damage-proof. Pretest all care products in a hidden area to make sure they are compatible with the leather. Never use saddle soaps, oils, all-purpose cleaners or solvents. Use of these products could damage the finish. To do everything possible to protect your investment in your fine leather furniture we recommend the Furniture Care Protection plan. Wood breathes, expands and contracts. Each piece of furniture is one-of-a-kind and will respond to changes in humidity levels in your home. Any expansion of joints or seams will revert to original shape and size as seasons change. Because each piece of wood is unique, you can expect variations in grain appearance and stain coloration. Random distressing applied by hand adds a distinctive heirloom appearance to the finish of some pieces. Ask your sales consultant if your furniture has this feature. The following tips will help keep your wood furniture in good condition for years to come. Drawer guides should be treated with paraffin or candle wax for smooth operation. Leaning chairs back on two legs must be avoided at all times, not only to preserve structural integrity but for your personal safety. Veneers and engineered finishes are easily taken care of by light dusting and periodically applying a quality furniture polish that is silicone-free. Do not leave wet dishes, glasses or spills on your wood furniture. Immediately wipe up any spills. Water will cause permanent damage to your beautiful wood furniture. Do not leave newspapers or magazines on wood because the inks can bleed onto the finish and then into the wood. Avoid placing furniture in direct sunlight, as sunlight causes fading. Use pads, cloth or felt to protect furniture surface from plastic, rubber, hot dishes, beverages, bookends, flowerpots and vases. A home humidifier for winter use is highly recommended for wood furniture. To do everything possible to protect your investment in your fine wood furniture we recommend the Furniture Care Protection plan. With proper maintenance you can maximize your area rug investment. Once each year turn rugs 180 degrees to even out sun exposure and alternate wear patterns. Frequent vacuuming benefits all rugs, but please do not vacuum rug fringe, or use beater-bar attachments on hooked rugs. Spot clean all spills with soda water, blotting with a white cloth. Quick reaction helps minimize the chances of a stain 'setting.' All stubborn stains should be treated by a professional rug cleaner. Please ask you Gardner-White home furnishing consultant for more specific information on the rug you have purchased. Care may vary by material and manufacturer. It is important to care for your new sleep surface so that it lasts for years to come. Here are suggestions to help you protect your investment. Ensure proper center support is used for queen and king-sized bedding. This is required to validate your warranty. 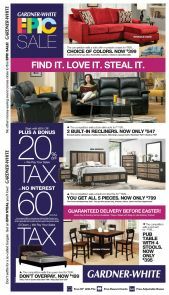 You can ensure you have the proper center support by purchasing a new bed frame or bedroom set with your bedding. This will ensure that you get the maximum benefit from your new sleep set. Allow your new bedding to air out. Residual odors from the manufacturing process may be present at first. They are not harmful and will dissipate with time. Use a high-quality washable mattress pad to keep your mattress clean and stain-free. Expect body impressions to form in the surface padding. They are normal and indicate layers are molding to your body contours. Take time to adjust to your new mattress. It often takes up to 60 days for your body to adjust to a new mattress. Do not remove the law label from your mattress. This is needed to identify your appropriate warranty coverage. Single-sided innerspring mattresses are designed for rest on one side only and cannot be flipped. An occasional rotation will equalize wear and extend the comfort life. Tempur-Pedic sleep sets are maintenance-free and designed to always give you comfort, relieve your pain, and make stress go away. In order to fully enjoy the unique experience of your Tempur-Pedic bed, we recommend the custom Tempur-Pedic pillows available at any Gardner-White location.